Fresh wood has a moisture content level of 50 % or more, meaning that a surprising amount of moisture must evaporate from the woodpile before you can use the firewood in your wood burning stove. Fell and chop your firewood during the winter and let it dry during spring and summer. Often it takes two years for it to dry. Cut the wood into short pieces. Short pieces will dry quicker than long pieces. The evaporation from the end of the logs is 10-15 % higher than from the long sides. Chop your wood in a way that leaves as many sides as possible without bark. Bark functions as a shell which encapsules the moisture. 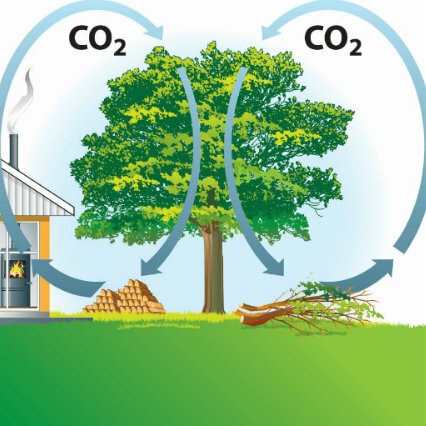 The more sides of the logs that are free of bark, the more moisture will evaporate. Furthermore, chopped wood has a higher efficiency in the wood burning stove when it’s been chopped into appropriately sized pieces. Tip: The length of your logs depends on how big the combustion chamber in your wood burning stove is. 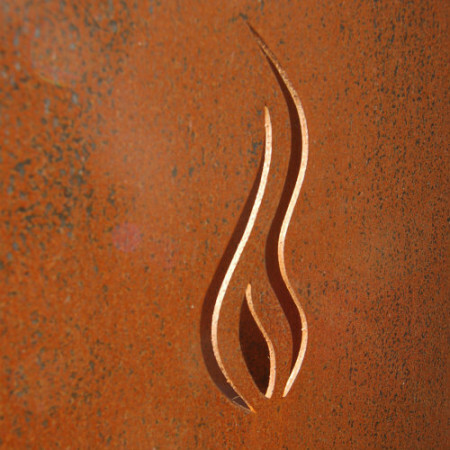 Most newer stoves have a standard measurement of 33-40 centimetres. 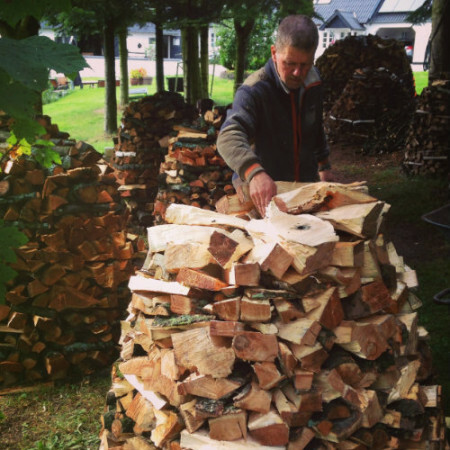 With a length of 33-40 centimentres it is easy to stack the firewood. If the logs are just a little bit shorter, the woodpile will easily collapse. It is easier to chop fresh wood. If too much time passes from the time of the felling, the wood will become hard and difficult to handle. The best time to chop hardwood is during the winter when the temperature is below 0° Celsius. 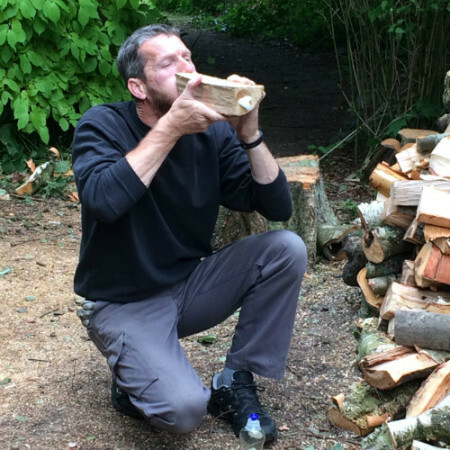 It is easier to split the log if you strike it at the top. It must be placed vertically on the chopping block. If the log is uneven turn it upside down. The log has natural grains and it will split along these grains. In the spring, when the wood has been cut into pieces, the grains will be visible on the ends of the log after a few days. The chopping block is important when you chop wood. It facilitates the process. A good chopping block is steady and has an appropriate size. It provides you with a good base when you chop wood. It’s a good idea to place the chopping block on a hard surface – this way all the energy will enter the log as it should as opposed to disappearing into the ground. How tall should the chopping block be? The height of the chopping block matters. It is a good idea to take your back into consideration when choosing a height. But you have to remember that the log will add to the height of the chopping block. If the block is too high, the axe won’t gain enough speed before it hits the log. You have found the right height when the edge of the axe strikes the log at a somewhat right angle. When you chop wood which has a length of 30-40 centimetres, the chopping block should be knee-high or lower. Tip: Fix a car tyre to the chopping block. 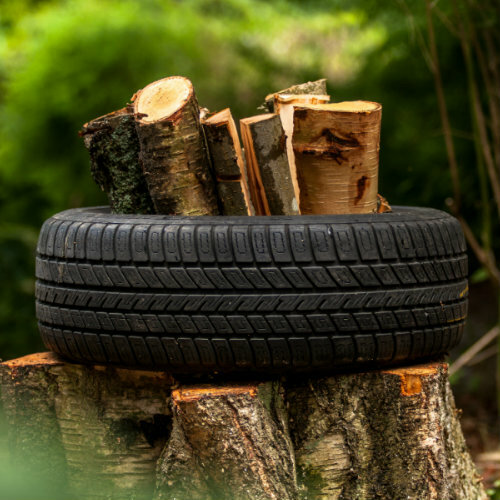 The tyre will keep the pieces of wood together when you split it. This way you won’t have to pick up the pieces from the ground when they fall. Alternately, you can tie a chain or a rope around the big pieces. 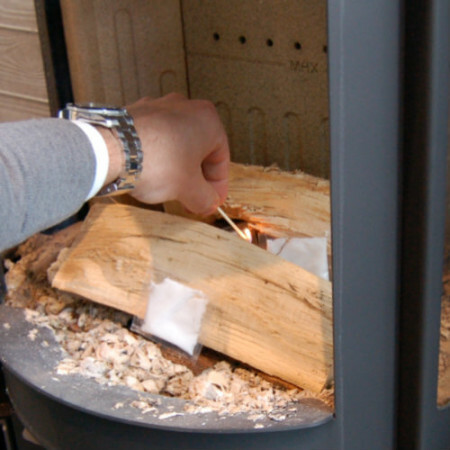 Are you firing correctly in your wood burning stove?